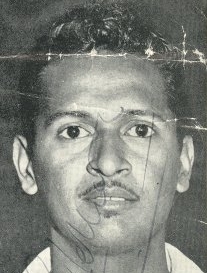 JOE SOLOMON ensured that his batting and bowling contributions to West Indian cricket would be marginalised when he secured the first tie in the history of Test cricket by running out Ian Meckiff in the first Test against Australia at Brisbane in 1960. In the 1950s he represented the Port Mourant Cricket Club, with future West Indies players Rohan Kanhai, Basil Butcher and Ivan Madray. He soon joined them in the Berbice county team, playing in the recently-inaugurated Jones Cup inter-county competition, before making a sensational start to his first class career. In October 1956 Solomon scored 114 not out on his first class debut, playing for Guyana against Jamaica, at Bourda. He followed this with 108 in his second first class match, and second first class innings, against Barbados, also at Bourda, one week later. Mysteriously absent from Guyana first class cricket in 1957, he scored yet another first class century, in his third first class match and third first class innings, for Guyana against Pakistan, at Bourda again. A gifted middle order batsman, the 28-year-old Solomon was selected for the 1958-59 tour to India and Pakistan, where he soon proved that he could be relied upon to buttress the middle-order batting when the better-known names failed. He made 45 and 86 on his debut in the second Test at Kanpur and an unbeaten 69 in the next game at Calcutta, sharing in a century stand with Sobers in even time. His 100 not out in the fifth match at Delhi, together with several other unbeaten innings, helped him to head the batting averages in India. After that, he maintained his momentum in Pakistan, scoring 66 in the defeat at Karachi and 56 in the win at Lahore. After an experiment at opening the innings against England in 1960 had failed, Solomon returned to the middle order with more success for the subsequent series in Australia. He made 67 and 45 in the first Test at Brisbane, before his fielding transformed the game, and cricket history. A century partnership between Alan Davidson and Richie Benaud had Australia coasting to victory, but two throws of pinpoint accuracy from Solomon changed the course of the match. On the first occasion he ran out Davidson, with just one stump to aim at. Then, with the scores level, he threw out last man Meckiff in almost identical fashion from the dramatic final ball of the match. For this he earned the nickname "Dead-Eyed Joe" from the Aussies. Many years later, in a discussion about those run-outs, Solomon said, "The secret was balance, to be perfectly steady as I took aim. You see, I was an East Indian country boy from Berbice. Out there, before we could walk we would be pitching marbles. Later, we would steal ripe mangoes by downing them with sharp little flat stones, not aiming at the fruit, of course, but at their stalks!" West Indies batsman Peter Lashley described the final moment, saying, "I was fielding close to Joe Solomon. I was at square leg and he was at midwicket. It was coming to my right hand, which was my throwing hand, and his left hand, which was not his throwing hand. I was the likely person to pick the ball up, but he'd just knocked down the stumps to run out Davidson, and he said, 'Move! Move! Move!' So I stopped, which was unusual for me. He swooped and picked the ball up and hit the stumps again. Had I picked the ball up there would have been no tied Test!" So popular were the West Indies and Joe Solomon after the tied first Test of that series, that the Aussie crowds booed Aussie skipper Richie Benaud for appealing successfully against Solomon in the second Test, after his cap fell onto the stumps as he played back to Benaud's top spinner. Solomon rarely showed that sort of flair as a batsman in a Test match, feeling obliged to play a more defensive role, which often proved invaluable for the West Indies. His bowling was precise more than penetrative. He was more fluent as a batsman for his strong Berbice county team, and made his highest first-class score of 201 not out for them against England in 1959 - 60. On the West Indies tour of England in 1963 Solomon scored 56 at Lord's and 62 at Headingley, while his 76 against Australia in the first Test at Kingston in 1965 helped the home side to a decisive victory. Although his cricket was never as gregarious as many of his contemporaries, Solomon could invariably he relied upon to plug any gaps in the batting or bowling departments when the more extravagant players disappointed. Indeed, the value of his contributions was most keenly felt after he left the Test scene and, for a couple of years, there was no obvious candidate for the West Indies to turn to when stars failed to shine. He served on the Guyana Cricket Board as President and Chairman of Selectors, and on the West Indies Cricket Board on the Regional Selection panel. In 2008, he was among the first inductees in the newly launched Berbice Cricket Board Hall of Fame. In 2009, he was also inducted into the newly launched Port Mourant Cricket Club Hall of Fame. Joe Solomon migrated to New York City, USA, in the 2000s.